After years of training and endless evaluations in a pre-debut system that was broadcast to the public, Pledis Entertainment’s new thirteen-member multinational boy group Seventeen finally made its official debut Tuesday in an hourlong live TV performance. “We’ve performed a lot of songs by other artists through the pre-debut system, but we’re very nervous because this is our first time performing our own tracks,” said member Woozi at a press conference at the MBC Dream Center in Ilsan, Tuesday. The name “Seventeen” refers to the sum of three numbers ― 13 members, in three subunit groups, coming together as one team. Through the MBC reality program “Seventeen Project: Debut Big Plan,” the members had completed missions while being split into a hip-hop unit, a vocal unit, and a performance unit. “Adore U” is a funky pop song about a teenage boy trying to navigate through puppy love. The performance for the song is structured almost like a scene from a musical, with the members breaking apart to perform different moves in separate parts of the stage, then coming together for the catchy chorus. “Shining Diamond,” a dance track which was revealed on Seventeen’s reality TV program, is also on the album, in addition to three tracks from each of the three unit groups. According to the members, the five tracks were carefully chosen from dozens that they had created to fit their core concept. 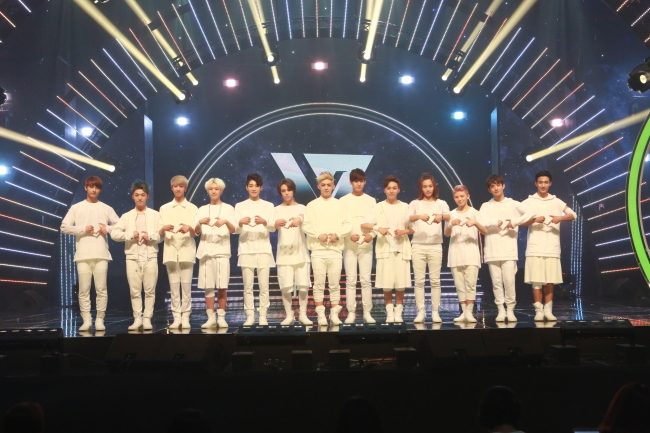 Seventeen made its official debut through a live broadcast Tuesday. The 13 members are S.coups, Wonwoo, Mingyu and Vernon in the hip-hop team, Woozi, Jeonghan, Joshua, Seungkwan and DK in the vocal team, and Hoshi, Jun, The 8 and Dino in the performance team. The group’s first EP “17 Carat” drops on Friday at noon.